Elephants and giraffe grazing together in the Masai Mara. When I visited Kenya for the third time, accompanied by several friends who were first-timers to Africa, I knew they were in for the trip of a lifetime. Our safari, Elephant Quest, surpassed all of our greatest hopes and expectations. Elephant Quest guests, Suzi and Rosalie, viewed wildlife during their camel trek from Sabuk Lodge to a feast-worthy breakfast in the bush with spectacular views of Mount Kenya. The wildlife was absolutely amazing. We didn’t see one lion — we saw a pride of 17. A cheetah mom helped her two nearly grown cubs learn to hunt on their own. 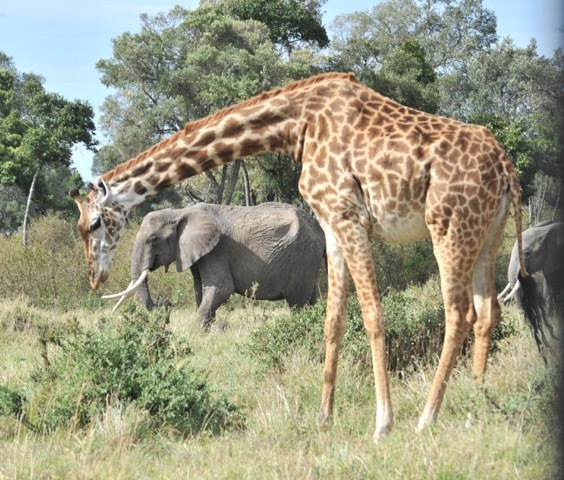 Groupings of giraffe and elephant grazed together. Fierce-looking Cape buffalo served as snack bars for birds, which landed by the dozens on their backs to devour ticks and flies. Hippos wallowed by the dozens in rivers and rested on dry land not far from huge, lethal-looking crocodiles. There were more brilliantly plumed birds than I can begin to identify. Every day was full of surprises, but the day I rode a horse through the bush filled my heart with joy. 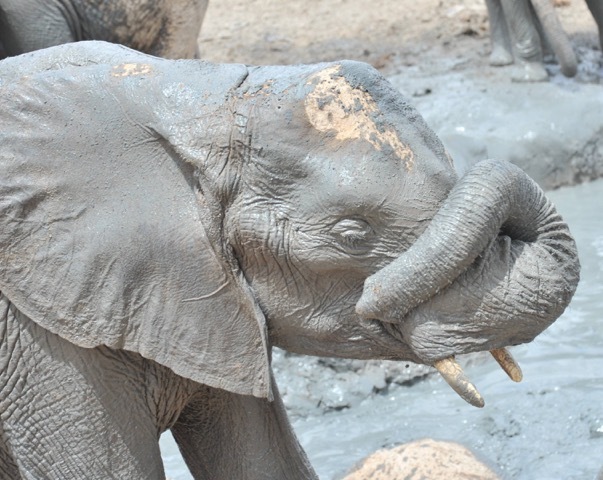 Shukuru, fresh out of the mud hole, looked so cute that Lauren simply had to foster a second elephant orphan. 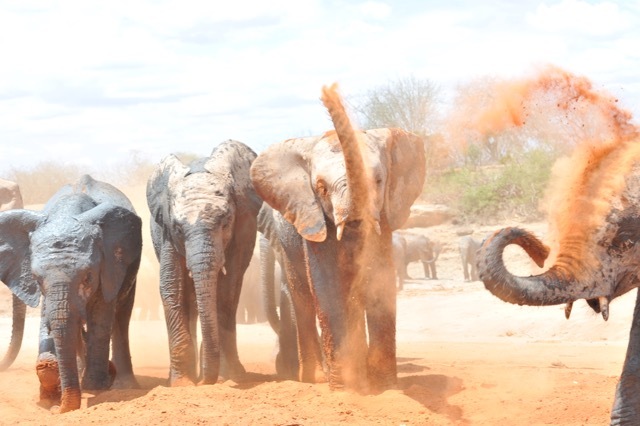 Elephant orphans at David Sheldrick Wildlife Trust’s Ithumba unit enjoy a dust bath after wallowing in the mudhole. Elephant Quest began with three nights at Ololo Safari Lodge, overlooking Nairobi National Park across its southern boundary, Mbagathi River. There’s nothing like recovering from long flights while being pampered with outstanding food and hospitality by Ololo’s owner, Joanna, and her wonderful staff. With Ololo’s wildlife guide, Ernest, at the wheel, we viewed lots of animals and birds in Nairobi National Park and visited the David Sheldrick Wildlife Trust Foundation’s nursery for elephant orphans. We all loved meeting the foster elephants and their caring, dedicated keepers. 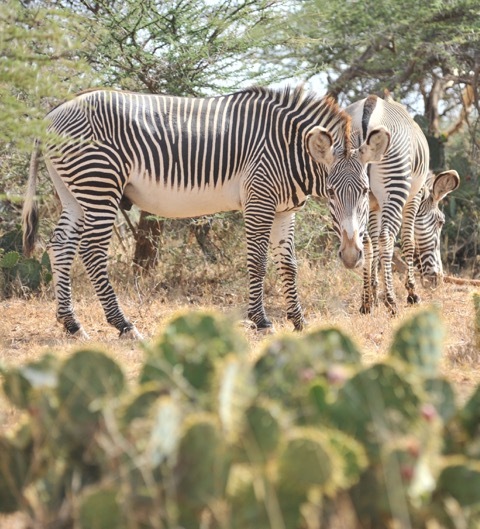 Grevy’s zebra, the largest and most threatened of the three species of zebra, featuring big rounded ears and unusual stripe pattern were viewed during Elephant Quest’s stay at Sabuk Lodge. Next we flew by charter flight to a remote region in Tsavo East National Park for three nights at Ihumba Hills, available only to supporters of the Sheldrick Trust. It’s an amazing experience to be that close to elephant orphans after they graduate from the Nairobi Nursery. Ithumba provides more advanced stages of the reintegration process that teaches them how to be wild again. Sheldrick Trust has several units in different locations to accommodate the needs of each orphan. It was unbelievably exciting to be so close to the orphans, who were joined by ex-orphans and their new families, plus huge wild elephants. Elephants can communicate over long distances by a sort of sonar stomach rumble. 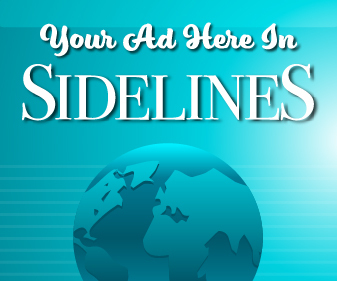 Matriarch-led families with aunties pitch in to raise their young. It was magical to watch totally wild elephants emerge from the bush to join the orphans and ex-orphans at the midday waterhole and mud wallow. 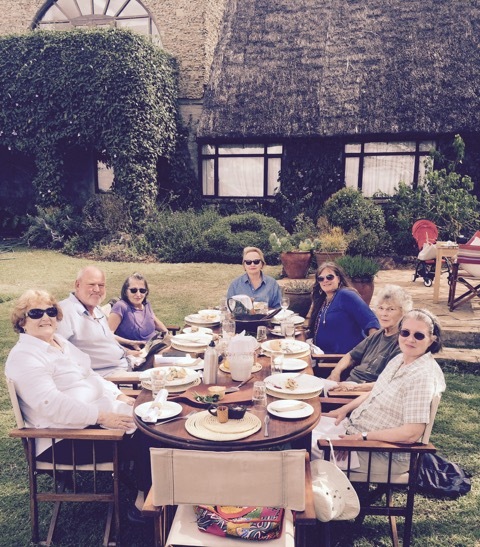 Elephant Quest enjoying Sunday lunch at Ololo Safari Lodge (clockwise from left): Karen, Chris Brennan (wildlife guide), Lauren, Suzi, Tamsin Corcoran (director New African Territories), Rosalie, Heather. One other highlight of Ithumba Hills, a self-catering camp, involved Tamsin, who planned, shopped, packed and supervised the preparation of the most amazing meals. Every time we sat down, it was a feast. Tamsin works with and books the best, so everywhere we went, at every lodge and camp, wonderful staff from local communities made incredible efforts to ensure our stay was comfortable, our meals delicious, our adventures fun and exciting, but still safe. 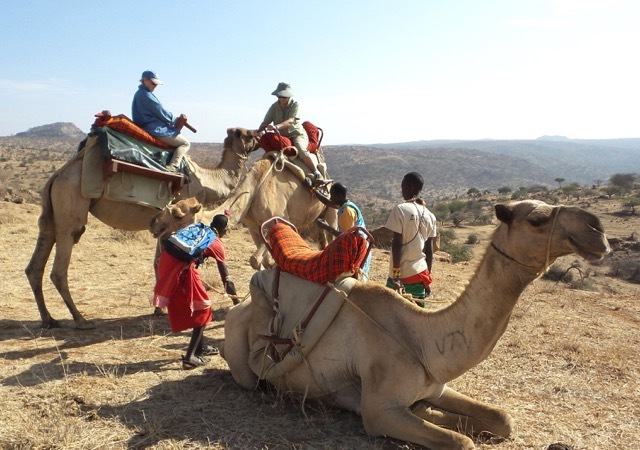 Sabuk Lodge, the third stop on our itinerary, offered special activities, including a cultural visit to the local school, meeting members of the local community, river walks, camel treks and horse riding. I felt totally blissed-out to be back in the saddle. Even though I hadn’t ridden in two years, I had a lifetime of muscle memory and spent a wonderful half-day on Hob, a sturdy Somali pony. With our guide, Paris, leading the way on another pony, we walked and trotted, as I wasn’t in any hurry to get to the bush brunch where we met the rest of my group. 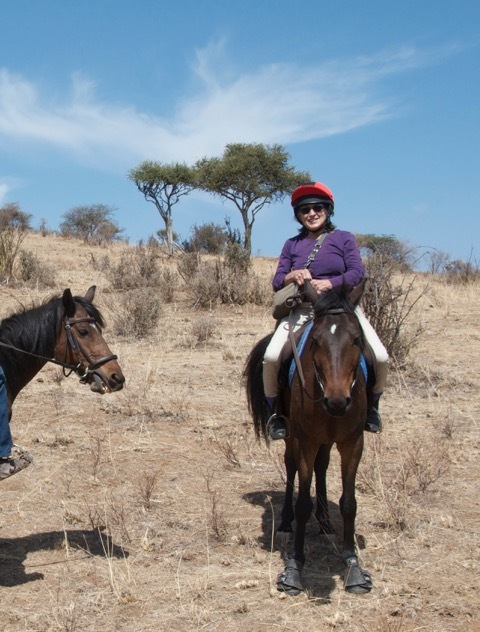 Lauren totally enjoyed her first-ever horseback ride in the bush on Hob and didn’t want it to end. Along the way we stopped for me to get a photo of a very tall nearby giraffe, nibbling leaves from a treetop. It all happened rather quickly. I had my arm through the reins, the smartphone in position — I touched the shutter the moment the giraffe picked up its head for a better look at us and Hob spun a 180. I stuck the spin and turned the pony back, but the giraffe was already vacating the premises. My photo came out too blurry to use, but I was pleased I didn’t buy cheap real estate or drop my smartphone. Other than that one little startle, Hob was a perfect gentleman. 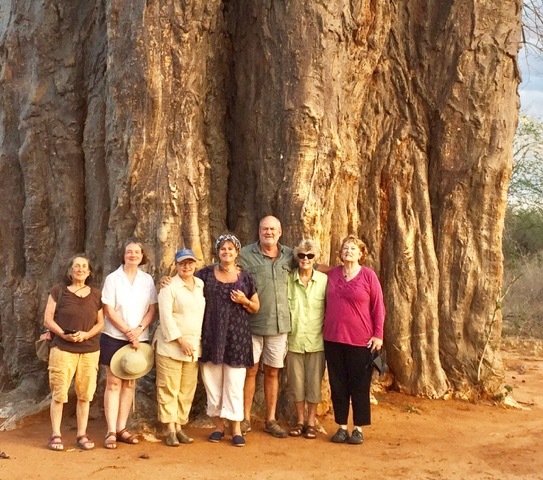 Lauren, Heather, Suzi, Tamsin, Chris, Rosalie and Karen — on safari with Elephant Quest —at the 1,000 year old baobab tree. 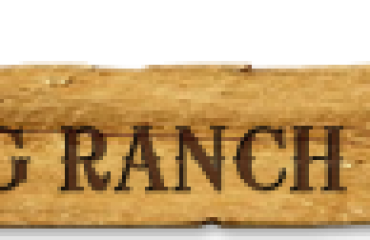 Brunch took place at a fully set table with freshly brewed hot coffee and tea, cold juice, water and all sorts of brunch dishes to delight taste buds while we feasted our eyes on the panoramic vista stretching to Mount Kenya and beyond. We even had a little tented comfort station and a place to wash our hands. I’m crazy about Kenya. It’s at the top of the list of my favorite destinations. I’m not into cities, but I absolutely love being out in the bush and rural areas. Much of rural Kenya looks like wilderness beautified by amazing panoramas, hills and valleys, mountains and spectacular vistas that seem to reach forever. Out in the bush, there’s little to no electricity and no city lights to dim black velvet night skies that glitter with the diamond sparkle of zillions of stars, unless there happens to be a full moon. 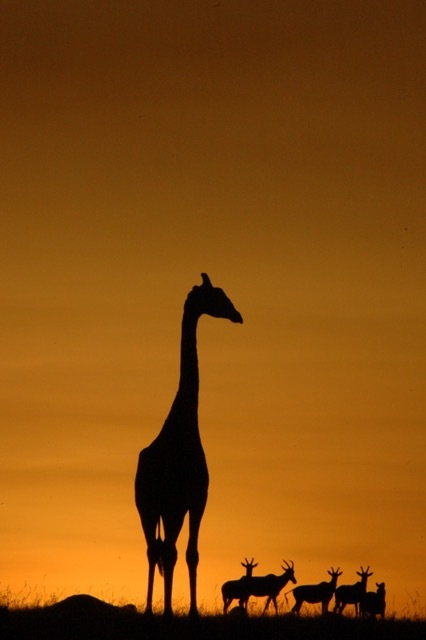 A brilliant sunset in the Masai Mara. We finished Elephant Quest with four nights at Speke’s Camp in the Masai Mara. We witnessed the dramatic rise of a fabulously large full moon — the first super moon since 1968, and it totally outshone the stars. The Mara was, of course, fascinating with wildlife. That’s where we saw the 17 lions, cheetahs, leopard, giraffes and elephants and much more. We explored every quadrant of the Mara. Weary but elated, we embarked on a farewell drive through the Mara to catch our Safarilink flight to Nairobi. We spent the rest of our last day meeting Tamsin for lunch, shopping, then dinner with Tamsin, Chris and their daughter Kyela before catching our international flights home. One member of Elephant Quest, Suzi Worsham, provided professional feedback. She and her husband, Travis, have 25-plus years in the restaurant, catering and hosting business with Riverside on the Potomac their latest venture. 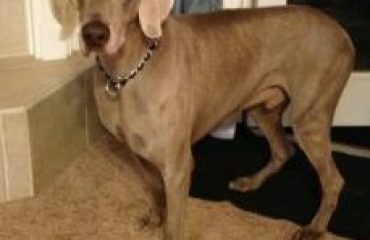 They’re also horse people, and Travis played polo for many years. 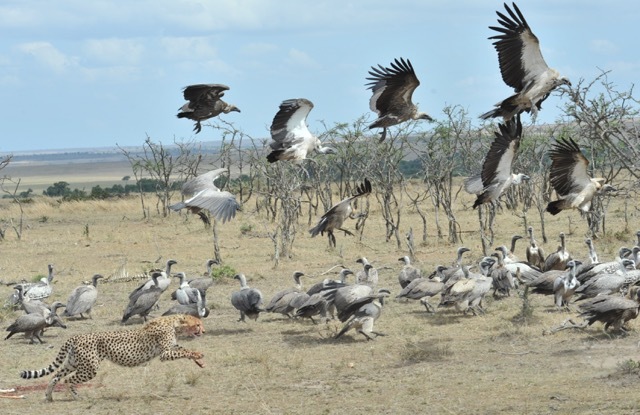 The wildlife was so abundant throughout Elephant Quest for photo opps: Lauren was especially pleased with this image of a nearly adult cheetah cub chasing vultures away from its dinner. 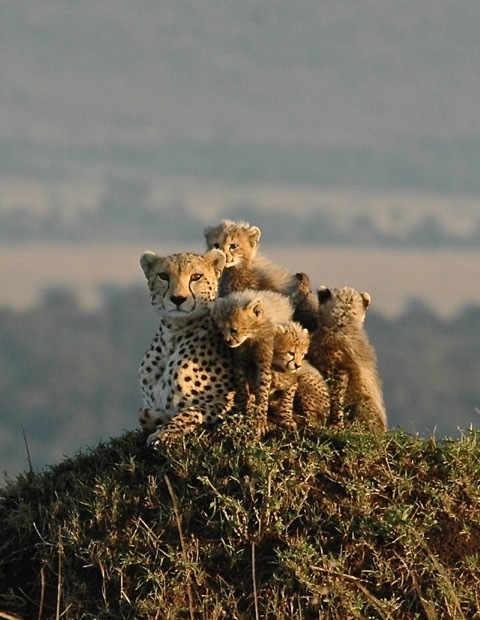 Cheetah family on a kopje (rocky outcropping) – the fastest “big cat” daytime hunters, renowned for achieving speeds of 68 -75 mph in short bursts. My favorite trip, too. I love Kenya and can’t wait to return. There’s so much more to see and do and photograph. I want to experience all that Kenya has to offer. Of course, riding is at the top of my new wish list. 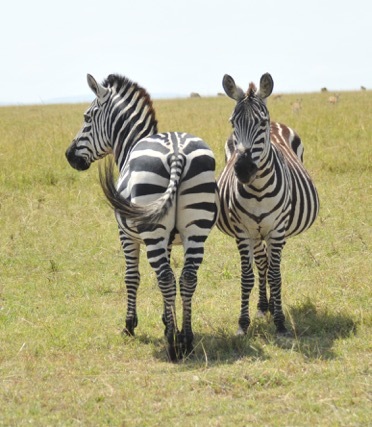 A nicely posed pair of Plains zebra, which remained plentiful in Kenya’s Masai Mara even after multitudes of all the grazing species followed the Great Migration back to the Serengeti in Tanzania. 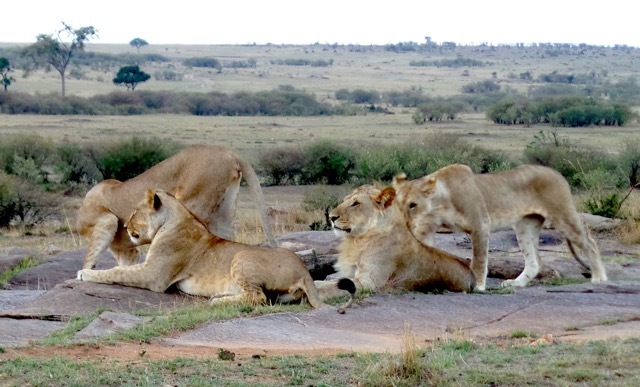 A few lionesses of the 17-lion pride that Elephant Quest observed in the Masai Mara.